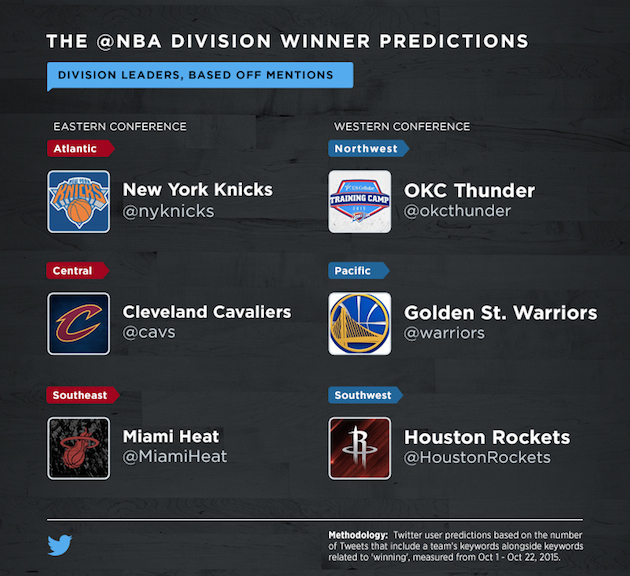 The NBA season begins Tuesday night, but Twitter users have already declared the winners of each division. Before the NBA season kicks off Tuesday, Twitter mined its data for tweets about teams and words related to winning in order to estimate what fans think of each team's chances of winning its division. 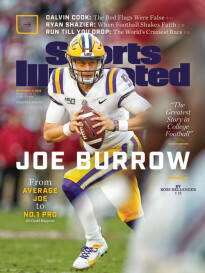 The Golden State Warriors, Cleveland Cavaliers and Houston Rockets all won their divisions last season, so their fans’ confidence is no surprise. The Miami Heat and Oklahoma City Thunder also finished respectably in 2014–15. But in spite of the New York Knicks’ conference-worst 17–65 record last season, their fans have apparently not been deterred from believing a division title is possible. • 2015–16 NBA Finals predictions: Who will win the championship this year? 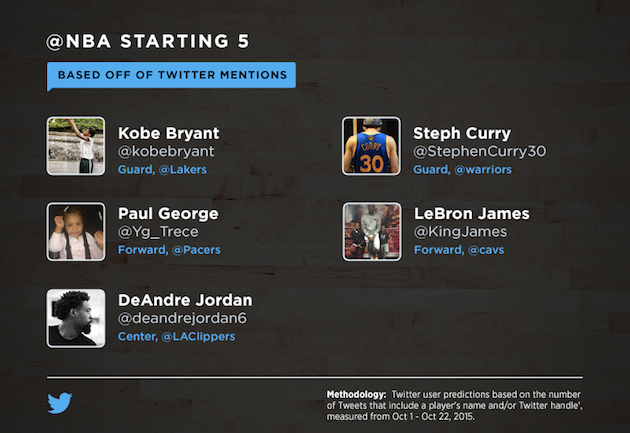 Twitter used a similar methodology to name the season’s “Starting 5.” Lakers guard Kobe Bryant, Warriors guard Stephen Curry, Pacers forward Paul George, Cavaliers forward LeBron James and Clippers center DeAndre Jordan were all picked for Twitter’s All-Star team. Accounts for NBA teams and players can be found all in one place with lists from the league and players’ union. The NBA season begins with three games on Tuesday, including two on national television. The Cavaliers play the Bulls at 8 p.m. ET on TNT, followed by the Warriors and Pelicans at 10:30 p.m. ET. The Pistons and Hawks play at 8 p.m. ET in a game that can be seen locally and on NBA League Pass.